Enter your email address below to receive a notification when ZChest starts accepting new sign-ups! Enter your email address below to receive a notification when ZChest is accepting new sign-ups again. Your box will ship between the 24th - 25th of every month. Please order by the 19th to get the current box. Monthly Zombies to Your Door! For less than the cost of a blood-drenched t-shirt get zombie products such as toys, collectibles, movies, music, posters, hats, socks, shirts, and a slew of whatever we can uncover in the graveyard (BRAINZ!?!) We love zombie stuff and would even venture into the zed filled mall, just to find goods and supplies to assist you in the rising Z. Got some pretty fun stuff. 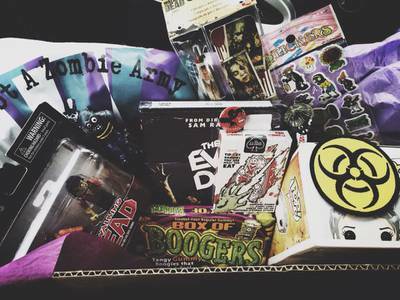 A t-shirt, a Beetlejuice Dorbz vinyl collectible, oven mitt, apocalypse sheriff sunglasses & some other little stuff. I sent this box to my boyfriend as a cheer me up gift, who at the moment lives in the states because of the recent events of hurricane Maria, lost everything and had to leave his family and me, his fiancee. You guys helped me give him a little something to smile about. I got him "The Bag Of Bones Gift Box" which you do not have to subscribe and they send everything that was left of previous boxes and he loved every single item.